1. What are the reasons for the need to properly control access to the contents of libraries in the Java language? Why do You need to use access control correctly? 2. What are the levels of access to the classes placed in the packages? 3. What does the term “package access” mean? 5. What are the advantages of using access within the package (by default)? 6. What does ‘public’ access type mean for a class implemented in a package? 8. Is it possible to add a private access modifier in the class name declaration? 9. Is it possible to add a protected access modifier in the class name declaration? Proper control of access to the program code means hiding code that can not be used by client programmers, and conversely, the general availability of code that can be used by third-party developers. In this case, the important is the ability to allocate a variable (changeable) component of the program code from a constant component. Hiding implementation is the basic idea (the main meaning) of access control. the ‘package’ access level. In this case, nothing is written before the word class. Within the package boundaries, the classes from this package are visible to each other. Manipulating these levels of access, the programmer “hides” or provides in common use the developed program code for its further use by other developers. This is the level of access within the package. It is also called default access. This level of access is established if the access specifier (private, protected, public) is not explicitly specified. At a packet access level, the class member is available to other classes of the current package. For classes that are implemented in other packages, this class member is considered to be hidden or private. The example declares a project named DemoPackages. The project creates two packages with the names PackageA, PackageB. 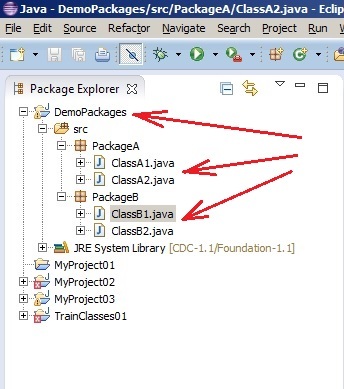 The PackageA package implements a library of two classes that have the names ClassA1 (located in the ClassA1.java module) and ClassA2 (located in the ClassA2.java module). The initial structure of the project is shown in Figure 1. Below are the program codes for the modules (files) ClassA1.java, ClassA2.java, ClassB1.java, ClassB2.java that correspond to ClassA1, ClassA2, ClassB1, ClassB2. The text of the module ClassA1.java. The class correctly creates an object of class ClassA2. This is logical, because ClassA1 and ClassA2 are declared in one package and have access within the package boundaries. However, trying to create a ClassB1 class object from another package will cause a compilation error. // PackageB.ClassB1 cB1 = new PackageB.ClassB1(); // error! The text of the module ClassA2.java. The class correctly creates an object of class ClassA1, because classes are declared in the same package. And of course, it will not work for ClassB1 by abbreviated name, because this class is implemented in another package (PackageB). The text of the module ClassB1.java. In the module, a ClassB2 class object is correctly created, because the ClassB1 and ClassB2 classes are in the same PackageB package, which is accessed by default. An attempt to create a ClassA1 class object is failed, because the ClassA1 class is declared in another package and there is no public access modifier for it. The text of the module ClassB2.java. The class correctly initializes a ClassB1 class variable because ClassB1 and ClassB2 are in the same package. the package code is fully controlled within the package. No one can access classes outside of the package, except for your own classes, which are implemented in the package. where PackageName – The name of the package in which the public class named PackageName is implemented. In a package, no more than one ‘public’ class can be declared. Let two packages with the names PackageA and PackageB are created in the project named DemoAccess. PackageA implements the ClassA class, which is of package access type (without access modifier). The PackageB package implements the class ClassB, which is declared with the modifier ‘public’. The structure of the DemoAccess project is shown in Figure 2. The ClassA class text from the PackageA package is the following. As you can see from the above code, you can easily access the PackageB.ClassB class, since this class is declared with the public access modifier. 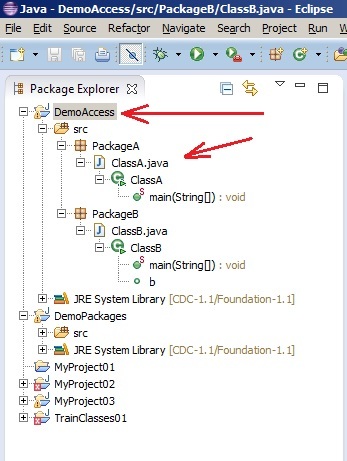 As you can see from the above code, you will not be able to access the class PackageA.ClassA, since this class is declared as a batch (without access modifier). It is important. In order to access the internal variable b of ClassB from ClassA, this variable must be declared with a public access modifier. No it isn’t. The Java language does not support the use of the private access modifier before the class name. That is, the following code is erroneous. No it isn’t. The protected access modifier is used for classes that provide their data members and methods for inherited classes. In the inherited classes, protected data members can be used, but they can not be used from objects of these classes (externally). But that’s another topic.